American military activity during Obama’s mandate. Even if the Obama administration was marked at its beginning by the award of the Nobel Peace Prize to the new elected President of the US, event that bolstered the idea that the new American administration would have been radically different to the previous one, the situation after eight years of Obama as President could not be more different than the begin of his administration. American interventionism during Obama’s mandate was in continuity with George Walker Bush’s administration, even though with a different grade. Both were defined by the adherence to the Wilsonian foreign policy doctrine. Obama reduced but kept American commitment in Afghanistan and Iraq, and determined the US intervention in Libya and Syria. It is quite clear that, even though Obama did not start a war as his predecessor, i.e. sending troops on Afghani and Iraqi ground, his administration has been actively interventionist and not at all peaceful. Here we will try to assess which is the Obama military legacy from the point of view of US military policy regarding the wars started by his predecessor, George W. Bush. American military presence in the world: US withdraw from Iraq and Afghanistan. During the 2008 presidential campaign, Obama vowed to withdraw US troops from Iraq within 16 months since his election. 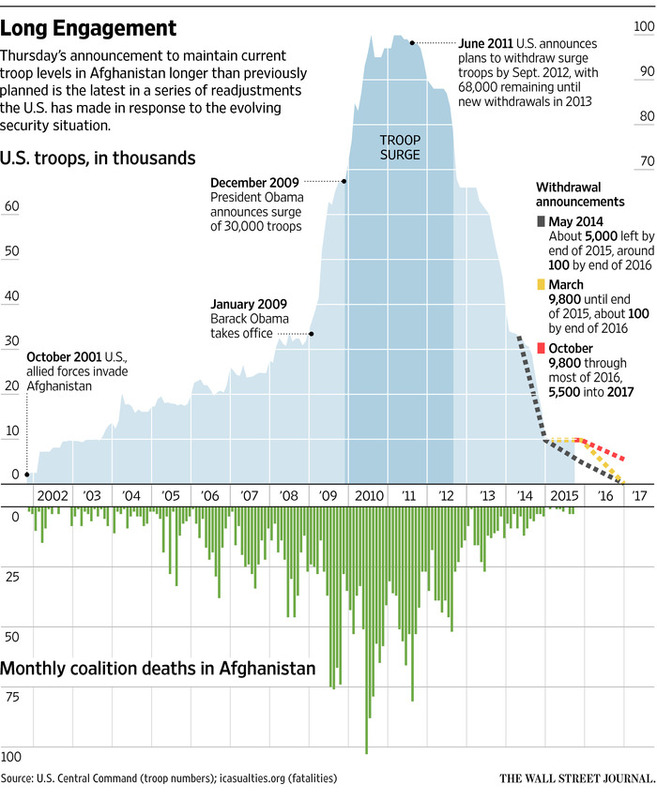 The troops deployed in Iraq have reached a peak in numbers in 2007, when there were 170,000 military personnel. However, at the very end of the Bush administration in 2008, the President of the USA signed a Status of Forces Agreement with the Iraqi government compelling the US to withdraw all of their troops in the Iraqi territory not later than 31 December 2011. On 18 December 2011 the last American combat troops left Iraq. Being so, stating that Obama was the prime responsible for the withdrawal of American troops from Iraq is not true. Nonetheless, troops withdrawal from Iraq helped the rise of the so-called Islamic State, even if not directly: one can assume that the troop withdrawal from Iraq had, at least, either a bad strategic planning or a poor strategic timing. Regarding the situation in Afghanistan, the context in which Obama’s action took place was quite different if compared with the Iraqi theatre. Obama assessed during the 2008 presidential campaign that the USA must refocus on the Afghani theatre of war and especially against Al-Qaeda members hiding there. In order to fulfil this main strategic objective to improve US security, Obama’s attitude has been all but pacific, as within a year of his administration American presence in Afghanistan doubled and then reached his peak in 2011. In the same period the Operation Neptune Spear, planned by the CIA, the Joint Special Operations Command and realized by the Navy Seal Team six and others, lead to the assassination of Osama bin Laden. This event can be seen as the turning point for American military presence in Afghanistan: after bin Laden assassination, in a public speech Obama announced the begin of the withdraw of American troops from Afghanistan “at steady pace”. In the last years, several plans for an almost complete withdraw of the troops have been established; nonetheless, the precarious situation in Afghanistan convinced Obama to keep a detachment of troops to help Afghani troops to counter the still present Taliban in the region; in 2014 a bilateral military convention determined the permanence on Afghani soil of 9,800 US troops plus approximately 4,000 to 5,000 non-American NATO troops; all these troops would train and help Afghani forces to control the territory and to realize operations against the Taliban. Still, the pace of the US troops drawdown slowed again, the US troops in Afghanistan can still perform operations against the Taliban without an Afghani government order and it is not clear neither when US/NATO troops in Afghanistan would cease to carry out combat duties, nor when they would leave that country. Did Obama put an end to the wars in Iraq and Afghanistan? It is not easy at all to determine if the wars in Iraq and Afghanistan are finished or not. Regarding the war in Iraq, it is true that, from a strict military point of view, the war in Iraq finished with George W. Bush “Mission Accomplished” speech on the Aircraft Carrier U.S.S. Lincoln on 1 May 2003, well before Obama took power. One can consider that war as an old-styled, conventional war; what happened afterward could be seen as another type of confrontation better described through the lenses of the category of “insurgency-counterinsurgency”. The political fragmentation and the multiplication of political-military actors after the fall of Baghdad and the capture of Saddam Hussein created a framework of instability that the American administration has been unable to counter. Possibly because of the raising discontent in the USA regarding the war in Iraq – already high before Obama election – and the Iraqi weapons of mass destruction scandal, Obama opted for a quick withdrawal of US troops in Iraq, so a domestic policy oriented choice. As stated before, this choice gave room for an increase in instability in Iraq and the emergence of ISIS in the north. It can be said that since the ISIS in Iraq received a strong support from former Baath military officers, the political-military responsibilities of the USA for the situation are clear. As it will be analysed in another post here on Changing World, American hesitation towards the Arab Spring especially in Syria compromised the situation even in Iraq. Taking into consideration the situation in Afghanistan, it can be said that the war in the Asian country has not yet finished. Indeed, the war in Afghanistan is barely comparable with the war in Iraq: American intervention in Afghanistan in 2001 has been since the very beginning a war against a partially conventional army – in October 2001 the Taliban had a standing army of 45,000 men plus an unknown number of conscripts – that adopted soon after the invasion a guerrilla way of warfare. From this point of view, it appears clear that the length of the confrontation between the USA and their allies and the Taliban would have been long. As referred before, Obama’s political option once in charge as US President has been focus American efforts towards Afghanistan against the Taliban, and the success of the Operation Neptune Spear can be seen as a political achievement for Obama. Nonetheless, war in Afghanistan has not yet finished and American hesitation in withdrawing their contingent deployed there is a clear proof of that. Furthermore, Taliban resurgence has recently been noted as they hold now more territory since 2001 when their regime was overthrown. Being so, the Obama’s military legacy regarding Iraq and Afghanistan is controversial. In Iraq the war against Saddam Hussein was won, but not during Obama’s mandate; nonetheless, the state-building process there has been weak and once American troops left Iraq a new menace spread there, i.e. the ISIS. In Afghanistan the characteristics of the war prevent to foresee when the political-military situation will stabilise, and possibly the war will continue far beyond the next few years. Being so, it can be said that Obama got a difficult military legacy from his predecessor; Obama’s focus on Afghanistan has been more successful than Iraq’s, but the very nature of former conflict prevented the US President to put an end to that war. Donald Trump, once in charge, will be still compelled to offer enduring solution to the conflicts in Iraq and Afghanistan. Barack Obama greets U.S. troops at Bagram Airfield in Afghanistan, 2012. Photo by By Pete Souza / Public domain.